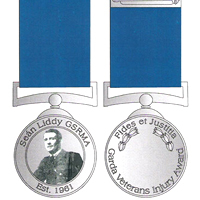 The Liddy Medal is so called in memory of the late Seán Liddy, a founding member of the Garda Síochána Retired Members’ Association (formerly called Garda pensioners’ Association). . Sean Liddy was the first President of the Garda Pensioners’ Association from 1961 until 1966. The awards were introduced by the Garda Síochána Retired Members’ Association in 2005.